His Christmas Sweater is available now! Here in Michigan, we just got our first real snowfall last night, and it’s past Thanksgiving, so you know what that means: the Christmas season is here! And just in time, my Christmas novella His Christmas Sweater is available now on Amazon! 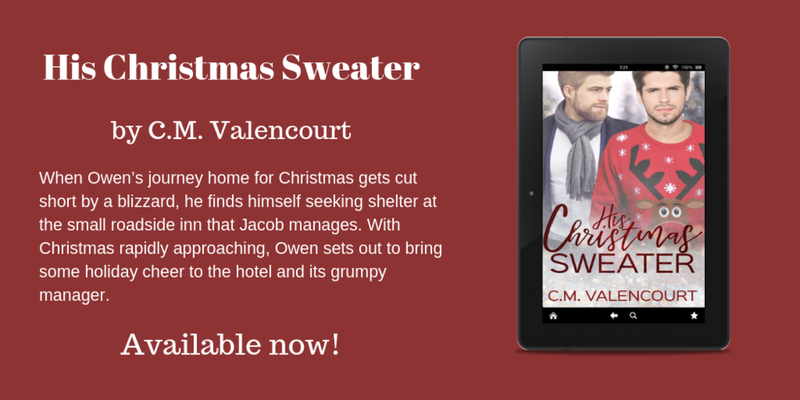 His Christmas Sweater is a cute, cozy m/m Christmas novella featuring a fat Christmas enthusiast named Owen, a small-town hotel manager who’s a bit of a grinch named Jacob, and tons of ugly Christmas sweaters! A holiday enthusiast. A grinch. A blizzard. What could go wrong? Owen loves Christmas. From November 1st to New Year’s Eve, his world is nothing but ugly sweaters, peppermint mochas, and Mariah Carey holiday singles. Jacob is a bit of a grinch. Since he’s gotten older, Christmas has never really been what he imagined. The closest he usually gets to festivities is an occasional bottle of peppermint schnapps. When Owen’s journey to his parents’ house for their famous Christmas celebration gets cut short by the worst blizzard central Colorado has seen in years, he finds himself seeking shelter at the small roadside inn that Jacob manages. With Christmas rapidly approaching, Owen sets out to bring some holiday cheer to the hotel and its grumpy manager. Will Jacob be able to let Owen in before roads clear and Owen drives away forever? His Christmas Sweater is available on Amazon now, and free to read in Kindle Unlimited! Hi, guys! I’m excited to tell you about my next release, a warm and fuzzy Christmas romance novella called His Christmas Sweater! His Christmas Sweater features too many glasses of eggnog, a grinch who needs some Christmas spirit, and a whole assortment of ugly Christmas sweaters. When Owen’s journey to his parents’ house for their famous Christmas celebration gets cut short by the worst blizzard central Colorado has seen in years, he find himself seeking shelter the small roadside inn that Jacob manages. With Christmas rapidly approaching, Owen sets out to bring some holiday cheer to the hotel and its grumpy manager. Will Jacob be able to let Owen in before roads clear and Owen drives away forever? And here’s the lovely cover, designed by Cate Ashwood! His Christmas Sweater is releasing next Monday, November 12th. Right now, you can add it to your Goodreads TBR or subscribe to my newsletter to get an email when the book goes live!